Johannes Itten was a Froebel trained elementary school teacher. After training in Geneva and Stuttgart, Johannes Itten settled in Vienna in 1916 where he taught at his own art school. He met Walter Gropius who, in 1919, invited him to join the Bauhaus which he had recently established in Weimar, the German capital. The Bauhaus was founded by the combining of the Weimar Art Academy, and the Weimar Arts and Crafts School. Students at this new school were trained by both an artist and a master craftsman. My preliminary course at the Bauhaus "Mein Vorkurs am Bauhaus"
Itten started the Bauhaus foundations course with its emphasis on unusual uses of common materials. Students were presented with discarded materials (wire mesh, cardboard, newspapers, matchboxes, phonograph needles and razor blades) and instructed to basteln; to improvise something. Other assignments involved the study of materials. Wood, feathers, mosses, hides had to be looked at, touched and drawn until they were known by heart and could be from memory. The idea was to transcend realistic reproduction to achieve an interpretative design instead of a mere imitation. It is said that this method was influenced by Friedrich Froebel's pedagogy of "education through play". Itten represented the central person of the early Bauhaus years. He influenced the first era of it. The foundations course established by him came out to be decisive for the teaching program of the school. Itten developed a general theory of contrast, the main theme of which was the "clair / obscure contrast", as the basis for this course. This was treated in various assignments: first in the form of checker-board patterns, then in abstract and finally in realistic works. Classical pictures were also analysed with the same aim in mind. By dividing it up into squares, the student was induced to work through the entire area of the picture with awareness, and to make a new decision each time regarding the respective grey value. 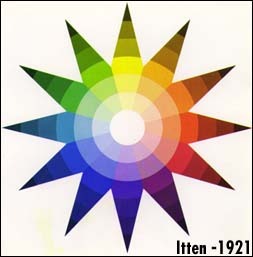 Itten initiated mandatory form and color education for Bauhaus students. He taught there until 1923, essentially on the concept of creation, focussing on form and color and in the process developing his theories on color and the color circle. In March 1923, Itten left the Bauhaus because Gropius no longer approved of his teaching methods - in particular of the preparatory meditation exercises and the Far-Eastern mysticism which this presupposed. Itten's departure was the first symptom of a general re-orientation of the school. The "romantic" or as others have called it, the universalistic era, came to an end. Johannes Itten wrote several books regarding theories of color. The most influencial was The Art of Color. The book deals with contrast, saturation and hue. Itten bases his theory on science and techniques of the masters. He created color wheels, stars, triangles and spheres to support his points. The color wheel was later incorporated into many systems including computer operating systems, in which it orgainizes color. Itten established a structural approach to the study and use of color based primarily on the light-dark opposition. The cold-warm contrast is probably the most important. The red-yellow color range is warm and the blue-green range is cool. Itten also cites complementary and simultaneous contrasts. His artistic endeavours sought to achieve an all-encompassing artistic production. He was later to teach in Berlin, Krefeld and Zurich where, after his retirement, he produced a considerable part of his work. Johannes Itten died in Zurich in 1967. "Color is life; for a world without color appears to us as dead. Colors are primordial ideas, the children of light." Mondaine Watch (Zurich) make a watch in honour of Johannes Itten with his color circle on the face. Ruedi K�lling attended the Zurich Art School where he trained under the Bauhaus instructor, Johannes Itten, whose teaching greatly influenced him. His career and work has been a reflection of the Bauhaus Design School which synthesizes technology, craftsmanship and design aesthetics. Mr. K�lling received additional training in Milan, London, Zurich and Chicago. In 1988, Mr. K�lling sold his Zurich-based design firm to Young & Rubicam. In 1989 Mr. K�lling founded K�lling + Partner, a design firm specializing in corporate communication/design and brand identity. Some of the firm's recent clients include Swissair; Zurich Insurance; the Swiss National Railway and Publisuisse, Swiss public television and radio. Mr. K�lling has received international recognition for his work and has posters and/or watch models on permanent exhibit at the London Design Museum, The Museum of Modern Art, New York, the Guggenheim Museum and the Museum of Architecture and Design in Chicago.